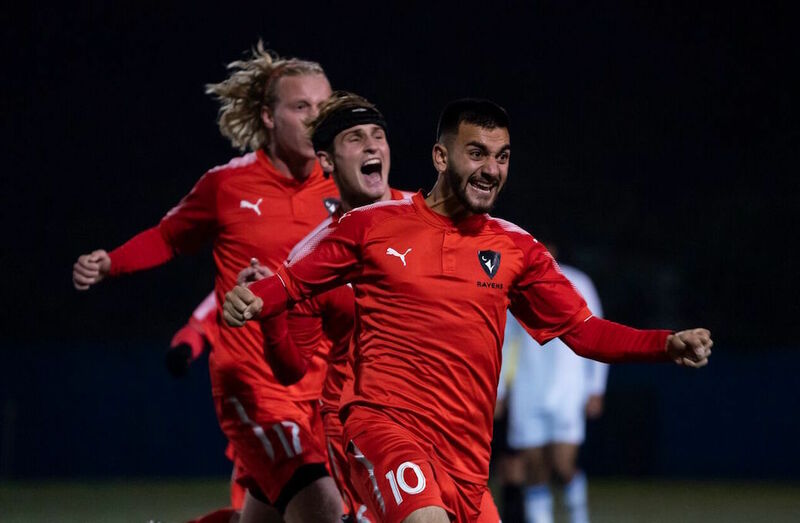 All-world performances from Carleton goalkeeper Nick Jeffs and forward Gabriel Bitar paved the way for the Ravens to upset the host UBC Thunderbirds in a 3-2 extra-time thriller on Thursday night at Thunderbird Stadium. 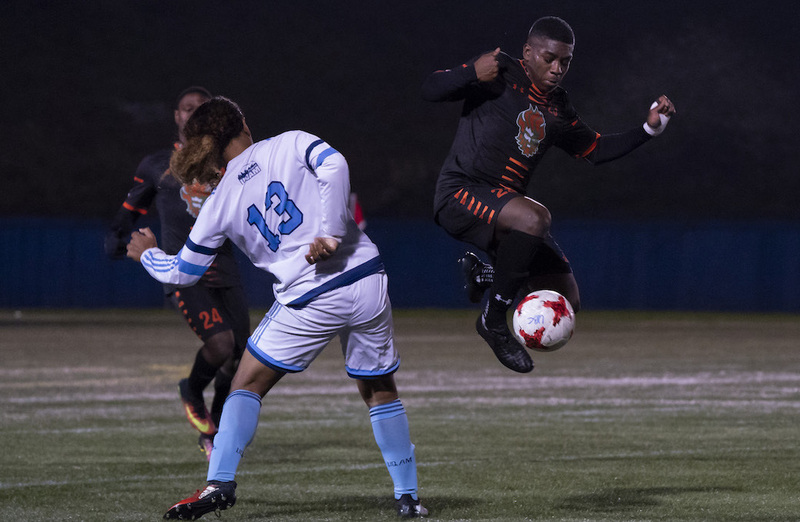 Bitar netted two goals, including the game-winner in extra time, while Jeffs weathered a ferocious UBC attack for 120 minutes in a nine-save performance. Mackenzie Cole and Connor Guilherme responded for UBC. The Thunderbirds nearly broke the game open early with a high-effort play from freshman Nick Fussell. The midfielder stripped a Carleton defender down the right flank, then placed a lovely ball in for Kristian Yli-Hietanen that found the forward in alone, but just offside. Yli-Hietanen had another near miss just minutes later, as a headed ball from Guilherme found the fourth-year forward alone in front, but Jeffs made a sprawling stop to keep the contest even at 0-0. While continuous pressure from UBC kept the Thunderbirds in control, another offside nullified another potential UBC goal at the 40-minute mark. UBC took an 8-0 lead in shots into the first half, keeping a Carleton side that averaged 3.81 goals per game during the season to minimal offence. The Ravens came inches away from taking a lead six minutes into the second half. Going full-tilt down the middle of the pitch, Bitar laid the ball off in space for Dante Cobisa. The fourth-year midfielder struck well, but just missed over the hands UBC keeper Jason Roberts and the bar. Nearing the 69th minute, Kiran Pannu found himself deep in the Carleton end of the pitch, curling in off the left flank and delivering a cross into Caleb Clarke. The former Vancouver Whitecap did well to get a head on the ball, putting it just outside the right post of the Ravens goal. In the 73rd minute, Bitar got Carleton on the board. Making a darting run up the middle into the scoring area, the sophomore cut sharply to the right and dialed up a brilliant strike into the bottom right corner of the goal. Throwing everything at the Ravens in the regulation’s dying minutes, Mosher got his answer off an 84th-minute corner. Zach Verhoven whipped in a strong ball from the corner, where the 6-foot-1 Yli-Hietanen got enough of the ball to knock it down. M⚽️// GOAL!! Connor Guilherme gets @ubctbirds back within a goal of @CURavens with time still on the clock in OT! Subbed in less than two minutes prior, Cole raced on to the loose ball, knocking it out of the air and in behind Jeffs to equalize. UBC came within inches of winning it in stoppage time, as Caleb Clarke played it to Rylan Sangha in tight, but the rookie just missed the left post, inciting gasps from the hometown crowd. A set piece got the Ravens back in front just a minute into extra time – a Cobisa corner found Cristopher Malekos in the box, and the big defender made quick work of the header. Bitar added the insurance marker in stoppage time of the first 15-minute extra session, navigating his way down the left wing between three Thunderbird defenders before nestling a shot into the bottom right corner. After a goal from Guilherme closed UBC’s deficit to one with under five minutes remaining in the second extra time period, Jeffs closed the door to close out the contest. In particular, a spectacular stop on a Yli-Hietanen header punctuated the visitors’ victory. The Ravens will now prepare for the Cape Breton Capers in the semifinals, with kickoff set for 9:30 p.m. ET / 6:30 p.m. PT on Friday. In the consolation bracket, UBC will take on the UQAM Citadins at 4:30 p.m. ET / 1:30 pm PT.